A while back I posted my research on the passiflora and the passionfruit plant. And after about a year of growing in pots and transplanting to the garden I have a great vine growing now. More to come on that progression but for now I’ve been doing some reading on hand pollinating the passiflora to help it set fruit. The passiflora has both male and female bits however they need to be pollinated from different flowers. The flowers can be from the same plant for most of the passiflora family. My notes are focussed on the Passiflora Edulis (or common purple) variety. Carpel – on the passiflora there are 3 (believed to represent the 3 nails used in the crucifixion) and their job is to collect the pollen. They do this through the commonly known stigma on the end of the carpel. The stigma collects the pollen, runs it down the pollen tube (known as the “style“) and into the ovary. Just like humans, it’s the ovary that’ll turn into a baby, in this case a passionfruit! 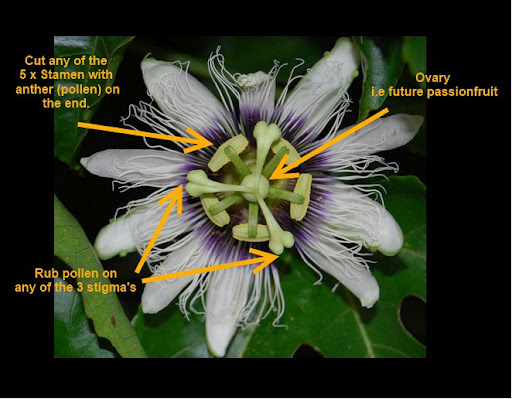 So with that easy bit of information, how can we hand pollinate a passiflora? Easy! While handpollinating seems straight forward there’s a feature of the passiflora that throws some complexity into the mix. In the early 20th century rich and famous women wore the passiflora flower as fashion accessories. They are quite an attractive flower but what probably made them more attractive was that they only flower for 24hrs. Open, pollinate, close and wither! While this exclusivity made it a fashion favourite it obviously plays against us handpollinators. If you have a large vine you should fine with a few flowers open each day but for smaller and less mature vines you might need to either watch the vine every day or collect the anthers. I can’t find anything specific on the passiflora but I’d suspect the pollen will last 24 – 48hrs, maybe more if you keep it chilled in the fridge. Let me know if you do any experiments on keeping pollen. I hope that helps get you more passionfruit set. Have you had to hand pollinate your flowers? Any tips you can share?